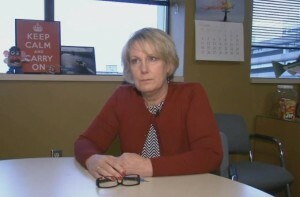 Spokane, Wash. — Spokane City Administrator Theresa Sanders accused Sheriff Knezovich of lying about her attempt to influence the language of a news release concerning an alleged sexual assault by a Spokane Police Officer. According to Knezovich, Sanders did not want the words “sexual assault” in the press release, because they are “inflammatory”. In a KHQ interview, Sanders vehemently denied the allegation, calling it a “fabrication” and promising “consequences” for the Sheriff. KHQ: To your knowledge, was there any move on the part of the City to call this anything but a “sexual assault”? Sanders: No, there never was, and, you know, Ozzie’s remarks are a pure fabrication, and there will in fact be consequences for him perpetuating that lie. I consider it to be a personal attack on my reputation and I intend to take action. KHQ: When you heard [the remarks], what was your first reaction? Sanders: That it was a complete fabrication, and I was amazed that the Sheriff would perpetuate a fabrication of that nature.